Two years ago my daughter Steph, then aged 14, was bored during the July school holidays and asked if she could sew with my scraps. I joyfully handed her all my scrap pieces of fabric, showed her how to be careful with the rotary cutter, and how to use the sewing machine. Quietly, and with much purpose and concentration, she leisurely pieced all day for more than a week, asking only for help when the "blocks" she had made could not be pieced together without a Y-seam. She really enjoyed the free-form piecing and whimsical construction. Steph pieced this top and I quilted it for her after repairing some seams that had almost no seam allowance. It is puffy, the borders are wavy and the quilt edges curve in and out, some of the piecing leaves a lot to be desired, but to me this quilt is a masterpiece. 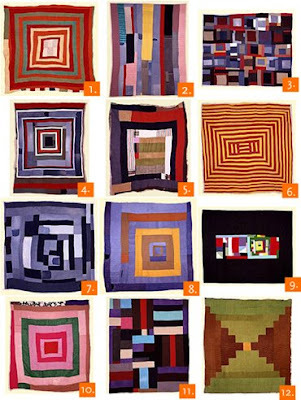 It also reminds me of the improvised piecing often found in the quilts from Gee's Bend. Gee’s Bend is a small rural and isolated community neatly tucked away in the curve in the Alabama River southwest of Selma, Alabama. The town’s women developed a distinctive, bold, and sophisticated quilting style based on traditional American (and African American) quilts, but with a geometric simplicity reminiscent of Amish quilts and modern art. They passed their quilting skills down through at least six generations to the present. Women with large families often made dozens upon dozens of quilts over the course of their lives. The Gee's Bend Quilts are so inspiring, their simplicity in design and color again a really striking combination. Stephanie pieced her quilt without prior knowledge of the Gee's Bend or improvisational quilts. I too have tried to make a free form quilt but without much success. I am an inhibited quilter, preferring structure, pattern, and tidy workmanship with 1/4 inch seam allowances, but need to work on stepping outside of the square. 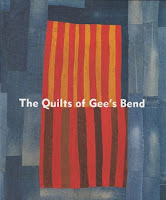 There are some great books that showcase quilts from the Women of Gee's Bend. Or better still, these quilts are still exhibited, and can be seen at venues according to this schedule. I am very familiar with the Gee's Bend quilters! 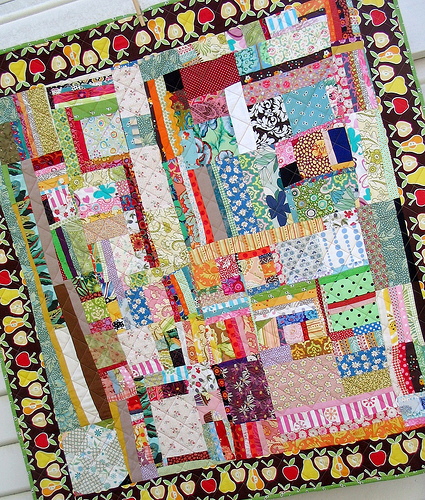 My favorite quilts to make are scrappy, no rules, who cares! I think your daughter's quilt is fabulous and a real treasure. Good for you mom in encouraging her. I think Steph's quilt is great - hope she always treasures it! Looking forward to reading this Post in depth when time permits! I love Steph's free-form piecing. I'll have to try that. As a teen I would not of attempted, much less accomplished,piecing a quilt. I am sure you inspire the whole family. Way to go Steph!! What a treasure. wow! i am in love with your daughter's quilt. all this at 14??? her creative ability is amazing... it takes most people a very long time to be able to just go at something like this! Like mother like daughter...I can see the creativity apple has not fallen far from the tree! Well done Steph!! Thanks for everyone who commented on my quilt, I would like to thank mum who put up with me having to use her sewing machine and use her scraps. Oh my word! I, too, was thinking masterpiece before I read it in your post. What a clever, clever girl. Clearly she has inherited many of your talents. Yes, it seems she does have a touch of the Gees Bend in her. What a beautiful piece of art!!! Good on you Steph !! I love the Steph's quilt! Congratulations! I think the quilt is absolutly beautiful, well done to your daughter. I love the Gee's Bend quilts. 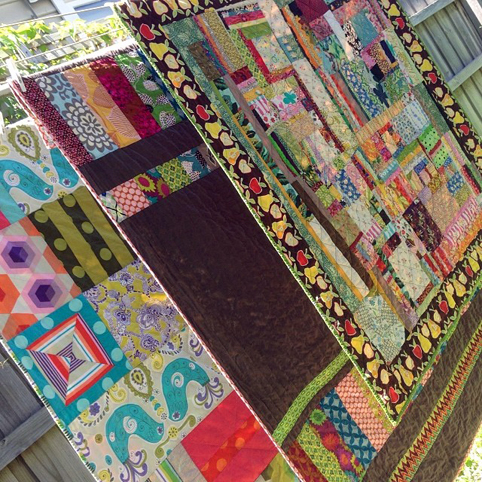 Has your daughter made more quilts since then? Steph's quilt is stunning! Is she making one this year? The creativity of children is always so wondeful and filling. Life just pours out without worrying if it is 'right'. What a wonderful quilt! You truly are one talented family! The quilt is wonderful! good job steph. Yes, it is a masterpiece. And has she sewn since? It seems to me that you alreayd have your own style of improvisation. Sometimes you seem to start quilts without a definite plan in mind. Improvisation isn't just about random or free piecing. It is about breaking free from patterns, kits, and doing things because we think we should. But I believe that you still need to follow the basics and have good seam allowances, press well, trim, and watch your colour balance. I hope someday my daughter will want do to as Steph did. The quilt is simply beautiful. I think it's a masterpiece also! I'm very impressed. 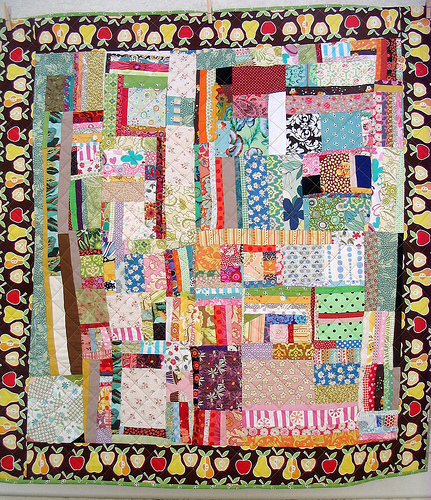 I love improvisational piecing - because that is my natural tendency! - and I find this inspirational. Good for Steph..it's nice to see the young ones taking on quilting, she will look back on this quilt for many years with fond memories..
Hope Stepg keeps on quilting..
What a special quilt this is. Makes me want to let down my guard and let my daughter free in my scrap bin! That is an awesome quilt, especially for a 14 year old. Love the new header on your blog too! Good for her!! It looks great. Very fun! Thanks for sharing. I love hearing about things like this!!! Your daughter's quilt is wonderful -- and I love the name of it. One of the highlights of my recent visit to the Sisters Outdoor Quilt Show was getting to meet and talk to 6 quilters from Gee's Bend. I've admired their work for so long! I just found out that they have some quilts on display at a local art gallery, so I have to head over there before Aug. 3. I have a picture of the Gee's Bend quilters, one of their quilts, and other quilts form the Sisters Quilt Show on my blog and on flickr (less pics on flickr). Feel free to take a peek. Umm, yeah! I thought it WAS a Gee's Bend quilt at first glance! Go Steph! 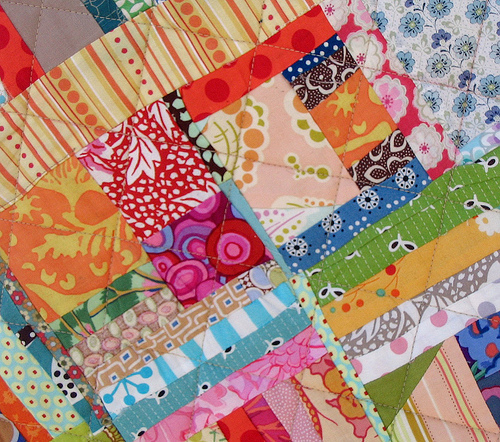 Your quilt is awesome in part BECAUSE of the waviness, not in spite of it. Keep doing what you do! I love your daughters quilt, its exhuberant and expressive. Maybe don't teach her too much so she can continue making more of them. Wow, I love that! I have one of the Gee's Bend books, and I definitely see the resemblance. Very organic! If you ever get a chance to see the Gee's Bend exhibit don't pass it up! The stories and quilts are so powerful and moving. It's definitely in my top 5 list of museum exhibits.